for himself! They were totally immersed in their projects, as you can see! My husband and I arrived in beautiful Santa Barbara last night to spend Christmas with my husband's family. Tonight our daughter Kate joined us. We will be celebrating Christmas with three other families and the holiday promises to be filled with conversation, children's laughter and the warmth of companionship. This is truly a blessing and we are so glad to be here. 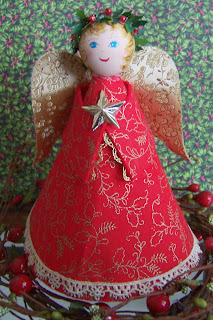 Another little angel, this time a fabric and felt ornament, came out of a box of my Mom's things. She had it hanging up all year long, as she did many of my fabric creations. I think of her and my Dad often during this season, but know that they are sending down their love and blessings especially during this festive time. Two days ago, a package arrived in the mail and I was really perplexed as to who had sent it, since I didn't recognize the name on the return address. As I debated on whether I should even open it, I suddenly remembered that I had won a prize in a giveaway on The Bunnies Bungalow, a blog by Debra K ! I was so delighted! 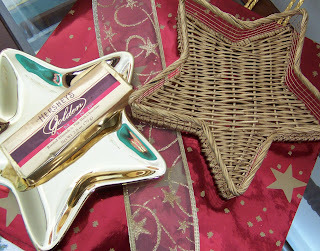 The box contained a lovely gold star dish, a star-shaped gold basket, two gift bags, a spool of ribbon and a lovely chocolate bar. The theme of stars and gold was wonderfully carried out and it amazed me that I had received such a thoughtful package from a complete stranger. Debra, many thanks. It was a very bright moment in my holiday season and each item will be put to good use. I wish you and your family a wonderful, very happy Christmas! Here's the little paper angel from two entries back, this time done in fabric over felt with a painted face. 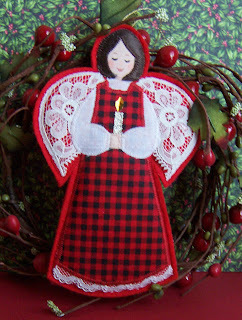 Over the years I've made angels in many forms and always enjoy designing and embellishing them. 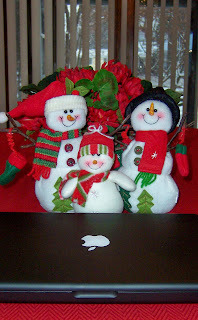 Lately I've been preparing for Christmas, decorating and buying gifts. Can't wait to spend time with family and especially my daughter. I'm hoping to have some good "hanging out" time with her and my husband. We'll be visiting some very dear relatives and I know we'll have a great time. 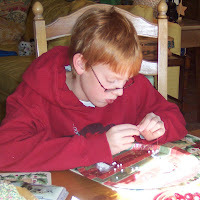 Knowing how antsy I get if I'm not working with my hands, I'm preparing some hand quilting to bring with me. We'll have plenty to do, but I'll bring some sewing and the old sketch pad for whatever ideas that happen along! I recently came across this card from a few years ago. 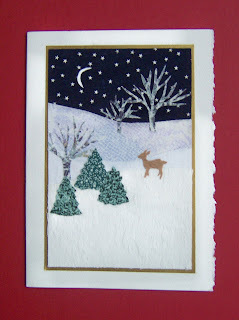 The design elements are cut from fused fabric and mounted on a blank card. I love to use different patterns and textures to add richness to a picture. 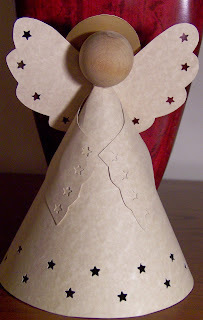 Here's a simple little angel, fashioned from parchment paper, a wooden ball and a circle of gold paper. I've used this pattern in various ways over the years, but love the stark simplicity of it done without frills, in natural colors. I'll show the same pattern with a totally different look in a future entry! I was delighted to find out today that I was a winner in a give- away over at The Bunnies' Bungalow . 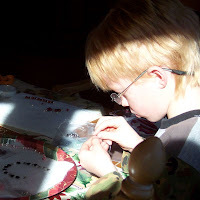 This is a great blog, recommended to me by my blogging friend KJ over at Eye-Dyllic. KJ's blog is full of great quotations, vintage illustrations, and is always fun and interesting to read! You should check out both blogs - I'm sure you'll enjoy them! The idea of learning something new (I had used only a PC before this) scared me no end, but my daughter assures me that I will be able to handle the new system and that she will give me personalized lessons when we get together at Christmas. How lucky am I !! It did snow here last night and everything is white, punctuated by the remaining leaves in various shades of brown. It's a bit bleak outside, with a promise of more snow to come. A good day for getting some work done! !